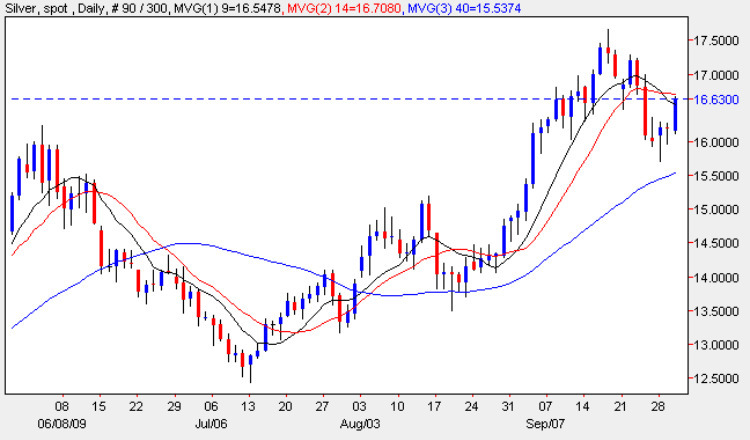 The strong bullish signal, which I first outlined in Tuesday’s post for spot silver, of a doji gravestone followed by a deep hammer candle, duly delivered yesterday with a strong move higher for spot silver prices, which closed the silver trading session with a wide spread up candle which ended marginally above the 9 day moving average. Whilst I forecast this the day before, as I always say, better late than never! The key now is whether this move has sufficient momentum to break back above the previous top in the $17.50 per ounce price level, and the first step towards this will be a break and hold back above both the 9 day and 14 day moving averages. Should this occur and coupled with support once again from all three, we should then see this price region under attack once again. However, the caveat remains with spot silver, which is simply that this price handle is the start of ana area of deep congestion, and whilst the gold price may pull silver higher, technically this area could provide a significant barrier to further progress, which is not the case on the gold chart, and as a result we could see gold prices acting as the driver for the industrial commodity in the medium term. This, of course, must all be read against the backdrop of Friday’s NFP data, which could send the US dollar lower once again should the numbers be worse than expected, and from yesterday’s ADP data, this could well be the case.